Long hours, busy schedules, or an unexpected change in circumstances are just a few of the reasons that people choose Callanan Veterinary Group to care for their dogs during the day. Our programs are designed to ensure your pal is getting the attention and exercise they need to stay fit, alert and happy in a safe and secure environment. Daycare is a great way to socialize a puppy and we can help reinforce training that you may be working on at home. Negative behavior can be greatly reduced or even reversed when dogs are not left home alone, such as inappropriate chewing, tearing up the trash, jumping, and relentless barking. All of our team members love dogs and are well-trained in dog behavior as well as positive reinforcement. All dogs are screened for temperment and placed in fully-supervised play groups of like-size dogs, providing a comfortable environment for them to socialize and burn off excess energy. Regardless of the age, size or breed of your dog, you can rest easy knowing that your pal is being well-cared for in your absence. Helps your pal stay fit and alert. Keeps her from getting lonely. No more worrying about rushing home to let him out or annoying the neighbors with excessive barking. Plenty of space to run, jump, dig and bark helps reduce or even eliminate bad behaviors at home. She will quickly adapt and look forward to hanging out with her new friends. Helps him become more friendly and confident with new dogs and people. This is a general overview of daycare policies at Callanan facilities; be sure to check at your preferred location for additional information or policies. We are happy to help your dog with vaccinations, spaying or neutering and eliminating fleas, ticks, and other parasites. Dogs are routine animals and so the introductory process for even easy-going animals can be somewhat stressful. Our team of dog handlers are very experienced and specifically trained to help dogs adapt to a new pack. In the event that your dog has difficulty adapting to socialization with other like-size dogs in their group we will discuss the situation and try to find new options to help with your daycare needs. All dogs must be up-to-date on vaccinations. Written documentation or telephone confirmation from a veterinarian is required. If your dog is not in compliance, we will be happy to administer vaccinations to bring your dog up to date. When the weather is bad we keep the fun indoors in our specially-designated dog play areas. 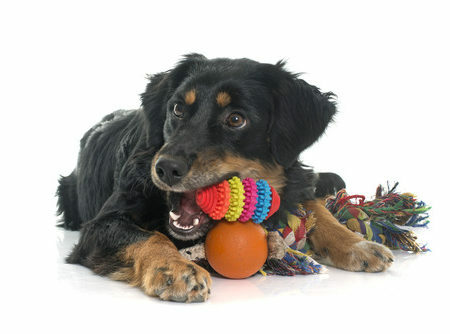 Daycare dogs typically engage in high levels of physical activity. Fresh water is always available, however due to the increased risk of life-threatening “bloat” (Gastric Dilatation-Volvulus or GDV) for dogs participating in vigorous activity within 1 hour of feeding, we do not provide meals. Large or deep-chested dogs, such as Great Danes, Collies, Dobermans, German Shepherds, or Boxers, but may affect smaller breeds, like Beagles and Bichons. For their safety, we recommend that daycare dogs are fed at least 2 hours before drop-off. Our daycare dogs are fully-supervised all day long by our experienced and well-trained staff. Facilities are protected with appropriate fencing and 24-hour electronic surveillance, including both video and motion sensors.